Well, it’s finally happened, Android users. Google has sold out its Android Gmail users and started delivering advertisements to the platform. These advertisements are mildly intrusive, but not quite annoying enough to switch to another email provider. The Gmail 4.6 update will cause advertisements to appear in your promotional inbox of Gmail. A recent Gmail update split your emails into Promotions, Social, and Primary folders. And now it appears that Google plans to use the Promotions folder to display your personal email promotions as well as a few promotions it thinks you would also enjoy. The advertisements are designed to look like regular emails from major companies. This may seem intrusive. However, if you take a look at your Promotions folder, you probably already have dozens of emails from major companies that you already ignore. What’s one more email added to that list? As long as Google doesn’t send emails to the Primary Gmail folder and doesn’t cause email notifications to pop up for advertising messages, I think most Android users will be okay with this change. The only time I check the Promotions folder of Gmail is to see if some important email accidentally entered that folder. Yes, most online services rely on advertising revenue in order to make money these days, including Google. If an occasional advertising email in my promotional Gmail inbox is all it takes to keep the service free, I’m okay with that. And besides, the desktop version of Gmail has had advertisements since the day it first launched in 2004. Everybody saw this coming for the mobile app. The only surprise is that it took this long. 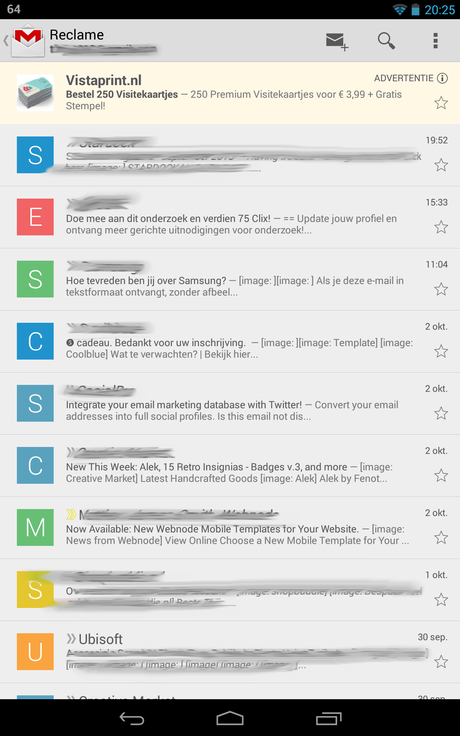 AndroidWorld.nl was the first to report on this issue, which is why the picture included in this article is of a Dutch email inbox.